Guido Hollaar is a member of the Supervisory Board of Anker Insurance and a member of the board of management of the Stichting Koersvast. In both organisations he acts as secretary. His areas of expertise with the Supervisory Board of Anker Insurance is human resources policy and remuneration policy. In addition, he is a member of the Audit, Remuneration and Risk committee. Other general focus areas are strategy, finance and assets, insurances and reinsurances, compliance, Solvency II, risk management and commerce. 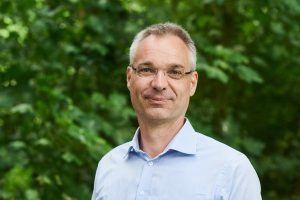 Guido Hollaar studied law at Erasmus University in Rotterdam and started his career as staff member for employment cases with the Royal Netherlands Shipowners Association in 1998. Since 1992 he has been employed at the Royal Netherlands Association of Shipowners, since 2011 as deputy manager. He has a thorough knowledge of the remuneration and labour market policy of seafarers on board the Dutch sea-going fleet, both of Dutch/EU seafarers and of non-EU seafarers. Guido Hollaar is a board member on behalf of employers of the Dutch Merchant Navy Pension Fund. In addition, he is a board member (treasurer) of the Maritime Awards Gala Foundation. Since 2018 duo chairman of the Dutch Association of Employers in Merchant Shipping.